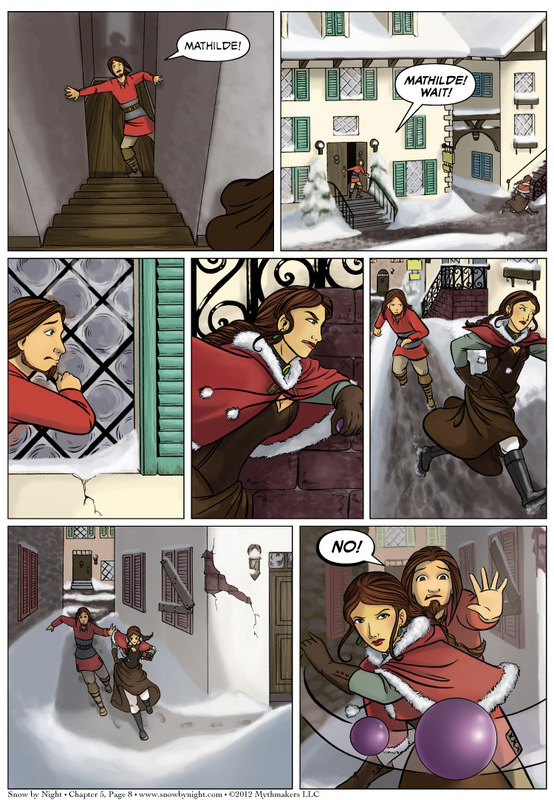 Mathilde is quick on her feet in Chapter 5 Page 8! I wonder how she and Snow by Night will get along? Something tells me pretty well once the shock factor wears off. You can see a sneak peak of Mathilde’s initial reaction by voting for us on Top Web Comics. I just hope Jassart doesn’t find out that Blaise spilled the beans to Mathilde XD. And oh hi! I’m Naty! The new colorist! I took over for Brittany at the beginning of Chapter 4. I hope you’ve enjoyed my contribution so far, cause this is a super fun story to color. Sometimes it’s so fun Eric has to make me tone down the sparkles whenever magic happens. Painting all the snow is a fun challenge and always takes longer than you’d think…at least for me. Our latest review from the I Am Legend blog thinks our combined efforts are pretty cool, too. They docked us points in popularity, but we’re working on that. You, dear readers, can help us out by telling your web-comic reading friends to check us out. C: I mean, how many other web comics out there have pocket manitou? I was weirded out by the perspective of the stairs, my eyes didn’t want to see him at the bottom rather than the top of the flight. Page five should’ve set me up for it though, that’s clearly a basement window in his room.